¿Está la Peste reemergiendo globalmente? 1 Associate Editor, Infectio Public Health and Infection Research Group, Faculty of Health Sciences, Universidad Tecnológica de Pereira, Pereira, Risaralda, Colombia. 2 Committee on Tropical Medicine, Zoonoses and Travel Medicine, Asociación Colombiana de Infectología, Bogotá, DC, Colombia. 3 Universidad Franz Tamayo/UNIFRANZ, Cochabamba, Bolivia. 4Tongji Hospital & Medical College, Huazhong University of Science & Technology, Wuhan, P.R. China. Emerging and reemerging diseases are cause of concern for the World Health Organization (WHO). On February 2018, WHO releases its list of priority pathogens that have the potential to cause a public health emergency, 1 given that for them there is no, or is insufficient, countermeasures, such as drugs and vaccines that help control outbreaks. Plague was discussed and considered for inclusion in the priority list, given the fact that poses major public health problem and further research and development is needed through existing major disease control initiatives, extensive R&D pipelines, existing funding streams, or established regulatory pathways for improved interventions. Experts recognized the need for improved diagnostics and vaccines for pneumonic plague. During the last years, the world has experienced recent significant outbreaks of plague, an infection caused by Yersinia pestis and transmitted by fleas. In Africa, Madagascar,2-4suffered during 2017 an outbreak, from the August 1 through November 22, 2017, with a total of 2348 confirmed, probable and suspected cases, including 202 deaths (case fatality rate [CFR] 8.6%). There were 1791 cases of pneumonic plague, of which 22% were confirmed, 34% were probable, and 44% were suspected. In addition to pneumonic cases, there were reports of 341 cases of bubonic plague, one case of septicemic plague and 215 cases with type unspecified. 1 However, other countries in Africa, such as the Democratic Republic of Congo, Uganda, Tanzania, have been affected since 2010.5 In Asia, China, Russia, Kyrgyzstan and Mongolia, have been also affected (Figure 1). Figure 1 Map distribution of natural foci, by the WHO, till 2016. In the Americas, United States (USA), Bolivia and Peru, have reported cases and outbreaks, including deaths. From 2010 to 2015, 3248 cases of plague in humans were globally reported, resulting in 584 deaths (CFR 17.98%). From them, 108 occurred in the Americas (apparently 3 in Bolivia, with 1 death; 39 in USA, with 5 deaths; and 66 from Peru, with 6 deaths) 5. Even though human plague cases are very localized and appear in only 18 of about 13,300 counties of Latin America, the risk is present and unexpected outbreaks could occur 6. In addition to USA, Bolivia and Peru, Brazil and Ecuador are also considered endemic (Figure 1). 6 Plague foci have been described in Argentina and Venezuela in previous decades, but no recent information has been found about active foci and no human cases have been reported since the 1950s and 60s. However, these countries are close to the window of possible re-emergence and in the particular case of Venezuela, given the current social and health crisis, with other tropical diseases without control, this would happens7. In April 16, 2018, the Departmental Health Service (SEDES) of La Paz reported that an 81-year-old woman in the municipality of Apolo, north of La Paz, died on 26 February 2018, due to bubonic plague, confirming the 1st case of this type of disease in 2018. The Epidemiology Unit of that health division indicated that the positive case was confirmed after a laboratory examination that led to the activation of an operation in the area, in order to interrupt the chain of transmission. The health contingent evaluated homes in the communities of Machua, Los Altos, Alto Humaca, and Suturi, where they also trained residents on the symptoms of the disease, its consequences and how to disinfect vulnerable areas with insecticides8. In July 12, 2018, a 42-year-old man died from bubonic plague in the Lambayeque region, Peru. He had contracted the disease in the Salas district, as confirmed by the Regional Health Management. The Unit of Epidemiology indicated that the patient likely acquired the disease in the Moistures Alto de Salas sector. However, the patient, who had been living in the USA for 7 years, was admitted to the Regional Hospital of Lambayeque, where bubonic plague was confirmed, later developing into septicemic plague9. 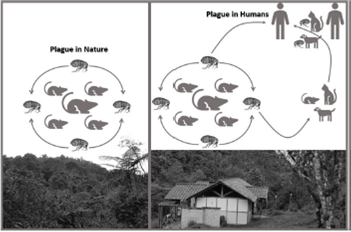 Plague is primarily a vector-borne disease, where the bacteria Yersinia pestis can be transmitted to humans by flea bites (Figure 2). Plague bacteria are most often transmitted by the bite of an infected flea. During plague epizootics, many rodents die, causing hungry fleas to seek other sources of blood. People and animals that visit places where rodents have recently died from plague are at risk of being infected from flea bites. Dogs and cats may also bring plague-infected fleas into the home. Flea bite exposure may result in primary bubonic plague or septicemic plague (Figure 2) 10. Transmission can occurs among wild rodents, including rock squirrels, ground squirrels, prairie dogs and wood rats (Figure 2). Figure 2 Cycle of Yersinia pestis in the nature and in humans. Finally, also infectious droplets are matter of concern for transmission. When a person has plague pneumonia, they may cough droplets containing the plague bacteria into air. If these bacteria-containing droplets are breathed in by another person, they can cause pneumonic plague (Figure 2). Typically, this requires direct and close contact with the person with pneumonic plague. Transmission of these droplets is the only way that plague can spread between people. This type of spread has not been documented in the United States since 1924, but still occurs with some frequency in developing countries. Cats are particularly susceptible to plague and can be infected by eating infected rodents. Sick cats pose a risk of transmitting infectious plague droplets to their owners or to veterinarians11. Several cases of human plague have occurred in the United States in recent decades as a result of contact with infected cats10. 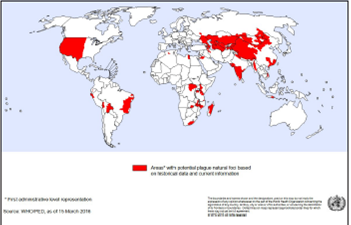 Plague, in the Middle Ages known as Black Death, continues to occur at permanent foci in many countries, in Africa, Asia, South America, and even the USA. During the last years outbreaks were reported from at least 3 geographical areas, in all cases after tens of years without reported cases12. As we have recently discussed for yellow fever,13 this situation is the good moment to remember the importance of the improvement of global response for vector control, recently revised by the World Health Organization (WHO) (October 2017)14. In this review, different approach strategies are highlighted and these should be multisectorial in order to be more effective, including the fact that these also impact on the Sustainable Development Goals, an aspect that have been also considered in the Colombian Plan of Public Health 2010-2021 15. In Colombia, we have historical data about an “infectious pneumonia” with high mortality rates that occurred during the same months, for three consecutive years (1913 to 1915) in the departments of Magdalena, Atlántico and Bolívar, located in the Colombian Atlantic coast, which suggested plague, but could not be confirmed.16 Although that, we have ecoepidemiological conditions prone for vector-borne diseases, such as dengue,17,18chikungunya,19-21Zika 22-24 and yellow fever,13 among others, in most of the territory, then, making of utmost importance the prevention and control of reemerging diseases, such as plague. Alfonso J. Rodríguez-Morales attended as Expert Participant in The 2018 Annual Review of the WHO R&D Blueprint Priority List of Diseases, WHO HQ Avenue Appia 20, 1211 Geneva, 6-7 February 2018, as well at the Workshop: Arboviruses and Risk of Urbanization, WHO, Geneva, Switzerland, 19-20 June 2018.